We are realizing that you all like to ask difficult questions, which is what we like to see in our clients! The pickier, the better; it helps us in designing something as close to perfection for your landscape as possible. However, time is a difficult concept and something that is hard to pinpoint. Imagine the response you would get if you asked a chef how long it would take him or her to cook their best meal? It depends on the day, the ingredients, the cooking conditions, and every other variable. 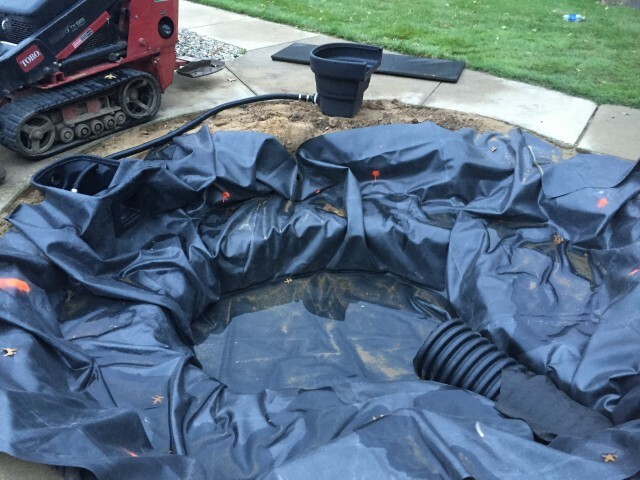 Building a pond does not happen overnight, and it’s always dependent on the size of the feature, how many people we have working on crew, and of course, the weather. In Michigan, that means you never know if your plans could change. This usually takes one day, but this is dependent upon the dirt getting dug up. Sometimes shale and/or clay can cause a delay in the dig, or perhaps a 40 year old tree that has 40 years of roots living in the space we need to dig through. The dig also includes setting up the biological filter and skimmer, which is dependent on perfecting heights and pitches. The steps at the base of the pond are crucial to efficiency and getting everything done on time. The steps at the base of the pond are crucial to accurately and efficiently completing the project on time. This step means that we are dropping the underlayment, which provides protection for the liner from any hazards remaining in contact with the feature below ground. This process takes a few hours depending on the crew because, per usual, it’s all about precision and attention to detail. The longer it takes, the more perfect it is. Patience is a virtue, friends. We call this process “rocking out” the pond. It’s quite simple: we cover the liner with rocks. This is time-consuming primarily because the crew is making sure the placement is perfect. Different types of rocks will create a certain look to the feature, and the variety of rocks will also give the pitch to the sound of the waterfall, so the crew is dealing with various types of rocks (depending on the look of the design). This process typically takes a day, but it also includes building the waterfall. Rocking out means water can roll out. Most clients love the additions to their ponds because it transforms the feature from looking like a natural landscape to an articulate design. These additions can vary from lights, extra plants, autofill lines, etc. These extras are all added in the same day, and this generally includes cleaning up. This varies from adding mulch to cleaning up the dirt around the feature so it looks neat and tidy. All of these final touches should take up a day in scheduling the build. Sure, the creation takes a few days (nothing this beautiful could be built overnight), but the result will give you a beautiful oasis that will make you forget what the question was in the first place.